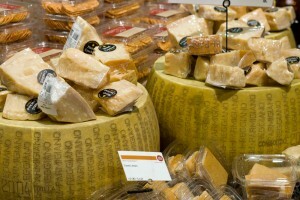 Parmigiano Reggiano is a perfect example of Whole Foods Market’s commitment to unique sourcing and providing the highest quality products. WFM only buys from 4 different Caseificios (producers) who are medium to small producers. Cathy personally knows each of the cheese makers and each wheel of Parmigiano Reggiano is completely traceable. 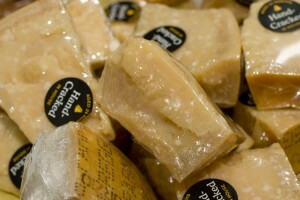 Parmigiano Reggiano is the number 1 selling cheese at WFM. Each year Whole Foods Market’s cheese expert Cathy Strange visits the Emilia Romanga region of Italy and selects wheels from just a handful of producers she knows personally. Not only is Cathy looking for quality, but also is selecting based on the flavor profile best for each region of the country! February 27 for the Crack heard around the world!